At a recent baby shower, my niece's mom-in-law brought a family favorite. The recipe she shared most likely comes from a Tupperware party, for reasons you can see. It literally is a quick shake in a gravy making container, using the lid for a measuring cup. Her recipe called for sliced apples sprinkled with cinnamon sugar and she served it with a caramel sauce. Today I'm shaing it with sliced stone fruit, served plain with ice cream. In quick shake place egg, sugar, flour, milk and oil. Shake until well mixed. Bake at 350 F for 30 - 40 minutes until nicely browned and crisp on top. Serve warm, with ice cream. I flip it upside down to serve. Makes 4 generous servings. P. S. The flip lid is the actual cup shaped lid while the seal is the tiny tunnel where the small, attached lid flips opens. I have the old style (2 cup meas) shaker with the large top lid to measure with. If you have a new one with a flatter kind of lid, use a regular measuring cup. What a great recipe!!! Thanks for giving the actual measurements (I don't have one of those quick shake thingys). Love recipes like this. How much flour and milk? Maria, 1 quick shake lid is 3/4 cup as listed with the sugar. 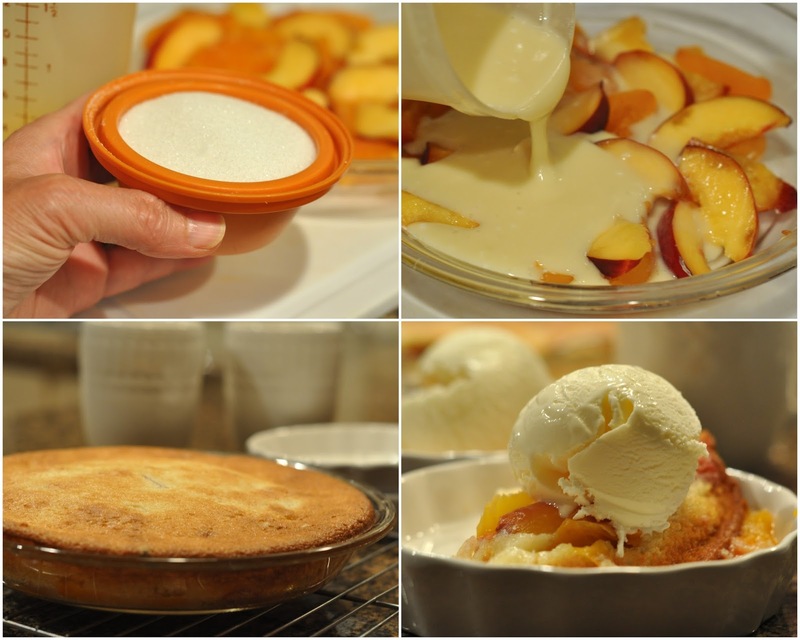 This reminds me of the cuppa, cuppa, cuppa...another delicious cobbler recipe.